Essential for breaking things down and making disparate ingredients into a homogeneous blend, the mortar and pestle is a well-used piece of equipment in my kitchen. Most mortar and pestle sets I see are more ornamental than functional, often made of lightweight materials and not having enough volume to hold ingredients. 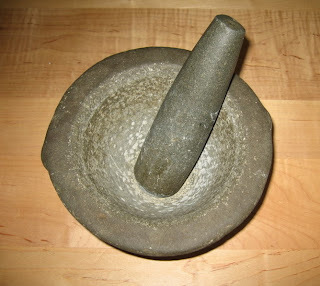 This mortar and pestle weighs 14.5 lbs: the mortar is 12 lbs and the pestle is 2.5 lbs. The weight is necessary to crush dried shrimp, tumeric root, chili peppers, lemon grass, pepper, basil, kha (galangal root,) garlic, and whatever else is added to it. Patrick, what a great start to your new site. I look forward to more food thoughts and political posts. On the food front, how about some thoughts on when to use a Ramekin and when to use a little bowl. Or, what does the Sommelier service with Nasty Rooster. Great stuff, Patrick. Keep it up. Where do you rec getting such an m&p? This mortar and pestle is from Thailand. In the US, Asian stores carry the best selection at the best prices. High-end cooking stores carry similar ones that usually cost a lot more.